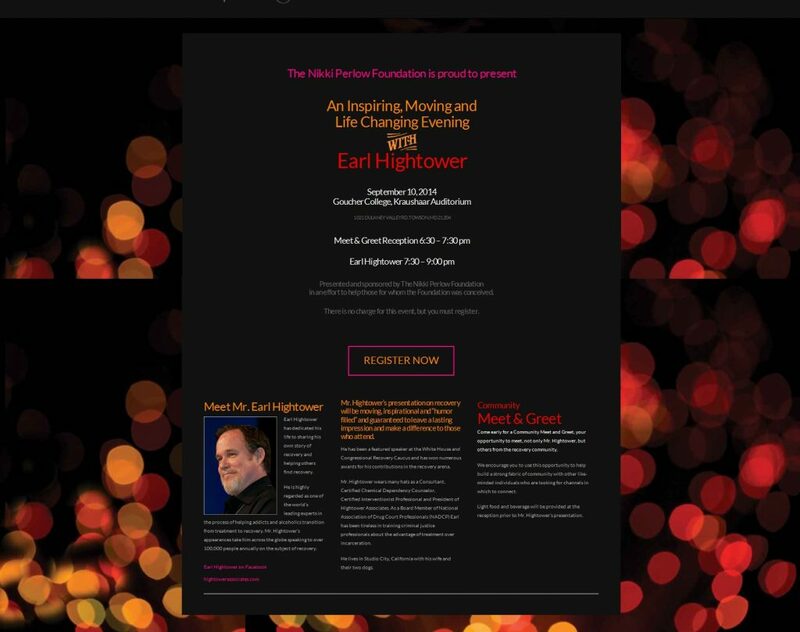 In an attempt to create a stronger recovery community in the Baltimore, Maryland area, The Nikki Perlow Foundation is presenting and sponsoring a special event on September 10th, with special guest speaker Earl Hightower. The event will take place from 6:30pm-9:30pm at Goucher College in Towson, Maryland with the first hour being a meet and greet reception followed by a 90 minute talk by Mr. Hightower. This inspiring and moving event has been created for those people in recovery, their families/friends and others who touch the recovery community and look to offer support for the recovery community. Maryland Addiction Recovery Center and our partner organization YPR-Maryland is happy to aid The Nikki Perlow Foundation in this important event. All three organizations have found a similar need in the Baltimore, MD area related to lacking resources for those suffering from addiction and in recovery. While there is strength in both local fellowships of Alcoholics Anonymous (AA) and Narcotics Anonymous (NA) as well as within individual home groups of those 12 Step Fellowships, there is a huge need to be filled related the supporting services and social services for the recovery community. A lack of recovery residences in Baltimore County, needed access to addiction treatment, breaking the stigma of addiction and aiding those new in recovery get employed or further education and work force skills are all areas lacking in the local Baltimore area. This night is one event that will attempt to bring together those in recovery with those supportive of recovery and members of the local community to strengthen the community to make Maryland more recovery-friendly. The Nikki Perlow Foundation is a foundation named after Nikki Perlow, a beautiful, vibrant young woman from Baltimore County who suffered from drug addiction and after 15 months of sobriety suffered a relapse and passed away from an accidental overdose one month shy of her 22nd birthday. The Nikki Perlow Foundation’s mission is to offer aid to young adults and their families struggling with drug addiction and recovery. Our goal is to provide financial, logistical and emotional support throughout their journey. Earl Hightower has dedicated his life to sharing his own story of recovery and helping others find recovery. He is highly regarded as one of the world’s leading experts in the process of helping addicts and alcoholics transition from treatment to recovery. Mr. Hightower’s appearances take him across the globe speaking to over 100,000 people annually on the subject of recovery. He has been a featured speaker at the White House and Congressional Recovery Caucus and has won numerous awards for his contributions in the recovery arena. Earl Hightower’s presentation on recovery will be moving, inspirational and “humor filled” and guaranteed to leave a lasting impression and make a difference to those who attend.